MUMBAI: Set India CEO Kunal Dasgupta is back to doing what he loves even more than the movies - playing the cricket broadcast game. The man who blindsided ESS in 2002 with an audacious $ 208 million sweep on seven-year ICC rights for the Indian subcontinent, that too when News Corp owned the global rights, has made a fresh cricket play. Set India has secured New Zealand cricket telecast rights for the next four years. Sony‘s winning bid: $ 50 million. Speaking exclusively to Indiantelevision.com, Set India CEO Kunal Dasgupta, while refusing comment on the price paid, confirmed the acquisition. That makes three boards - England, Australia (both with ESPN Star Sports) and New Zealand - where telecast rights have been secured for the next four-five years. Which leaves Pakistan, Sri Lanka, West Indies, South Africa and Zimbabwe that remain to be locked into long term deals. Queried as to whether Sony would be bidding for any of these boards as and when they opened up, Dasgupta replied in the affirmative. That‘s not all. The way the ongoing Twenty20 World Cup has caught the fancy of viewers has got the portly Set India CEO more than interested. 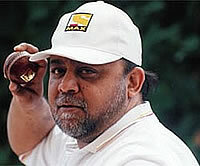 "We will also be bidding for the BCCI‘s Indian Premier League and the Champions Twenty20 League," Dasgupta asserts. The Indian Premier League (IPL), structured as a franchisee-based Twenty20 Series, is scheduled to kick off in April 2008. The final leg of the competition, which will be run by the four cricket boards of India, England, Australia and South Africa, is called ‘Champions Twenty20 League‘ and will be held in October 2008. Sony‘s acquisition of the New Zealand cricket rights harks back to what the broadcaster did in the late ‘90s, wherein it had the rights to Sri Lanka cricket. It may also be recalled that when Max launched as a cricket and movies channel in 1999, it had the Sharjah rights as its key cricketing property.